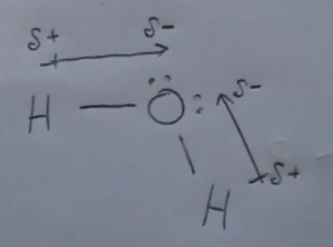 Hydrogen bonding is a special form of dipole to dipole interaction between molecules. Hydrogen bonding between molecules is possible when hydrogen is combined with nitrogen, oxygen or fluorine. Lets consider 2 molecules of water. We know that all molecules are attracted to each other by weak dispersion forces. Water molecules are also bipolar so we know they have dipole-dipole forces. Water has and even stronger force causing its molecules to be attracted to each other and that is hydrogen bonding. Hydrogen bonding is an intermolecular force in which a relatively positive charged hydrogen in one molecule is attracted to a relatively negative charged atom in an adjacent molecule. In this illustration the notation δ+ |———> δ- (delta+ |———> delta– ) is used to indicate the partial charge difference across the covalent bonds in the water molecule. The arrow points in the direction of the more electronegative atom. Looking at the periodic table, electronegativity increases with atomic number within each period. In period 2, fluorine (F) is more electronegative than oxygen (O) which is more electronegative than nitrogen (N). They are all more electronegative than hydrogen (H) so the direction of δ+ |———> δ- in a hydrogen bond is always from hydrogen to the more electronegative atom. This indicates that there is a relative negative charge on the oxygen atom which is balanced by a relative positive charge split between the 2 hydrogen atoms. Hydrogen covalently bonded to nitrogen, oxygen or fluorine may form hydrogen bonds with the nitrogen, oxygen or fluorine of another molecule. 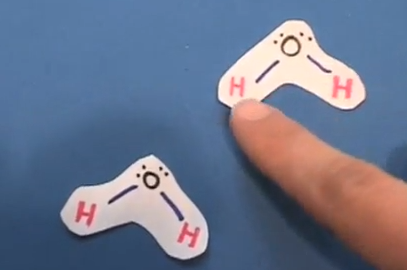 The hydrogen bond is not as strong as a covalent bond when electrons are shared. It is not as strong as an ionic bond when a full charge (electron) is transferred from the cation to the anion. It is a very strong dipole to dipole attraction. This special dipole-dipole attraction occurs when these 3 small electronegative atoms combine with hydrogen. The bond length is not as long. This “bond” is illustrated by using a dotted line as in this illustration. Hydrogen bonding of water explains the physical states of water related to temperature. At a high temperature, water is a gas. When the temperature is above the boiling point, the water molecules are moving very rapidly and have too much energy to be attracted to each other by hydrogen bonds so they disperse separately as a gas. As the temperature cools, the water molecules do not move as rapidly and are attracted to each other causing water to condense into a liquid form. As a liquid, it can be confined to a smaller container than a gas at the same pressure. If the temperature falls below the melting point, the water molecules slow down and the hydrogen bonds begin to form a lattice which we know as snow flakes or ice crystals. 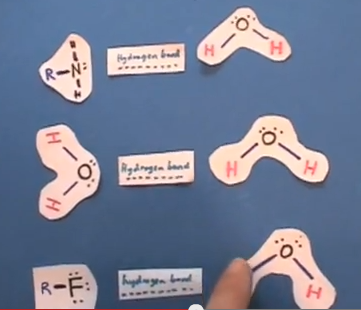 Hydrogen bonds are also important in biochemistry and vital to life processes. They hold proteins and enzymes together. They also hold DNA together. 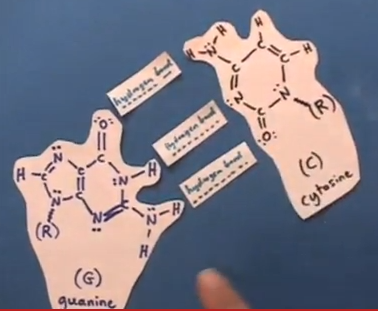 This shows how hydrogen bonds link the base pairs guanine and cytosine together in the DNA helix as proposed by Watson and Crick in 1953. The “R” group is the sugar-phosphate backbone of the helix. 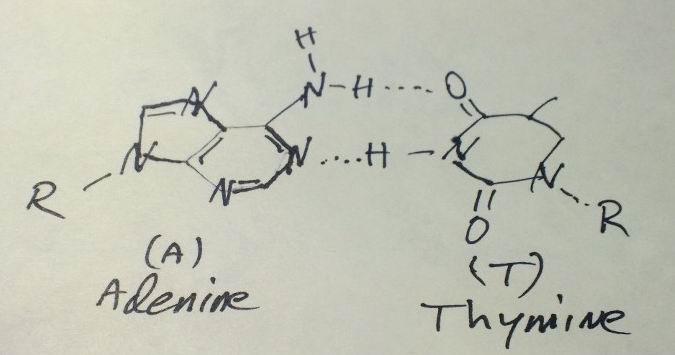 Adenine forms hydrogen bonds with thymine as the other base pair in DNA.